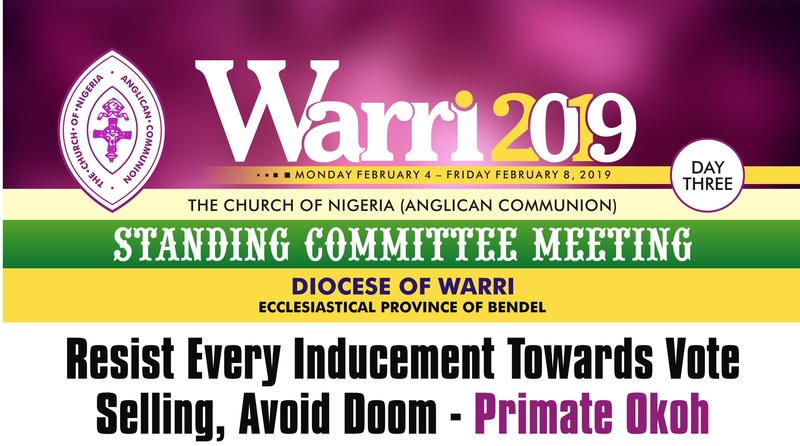 In his Opening Address to the Standing Committee meeting at the Cathedral Church of St Andrew Warri in Delta state, the Primate harped on a number of issues bordering on insecurity around the country, New Minimum wage; ASUU strike, 2019 General Elections. 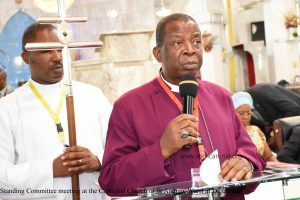 Primate Okoh called on the Federal Government and the stake holders to consider the reviving of the economy generally as a matter of urgency. He said the crux of the matter now is the elections. He therefore appealed to voters to resist every inducement tended towards vote selling to avoid doom in the coming years. He appealed to INEC on behalf of the Church to maintain a posture of an unbiased umpire and enjoined the security agencies to ensure a free, fair and credible elections. The Primate, Most Rev. Nicholas .D. Okoh, also called on Youth to refuse to be used to create chaos by men and women whose children are safe outside the shores of this country and appealed to all contestants to allow the election process to be peaceful, free and fair since we are all under God who will judge. He therefore prayed that all stakeholders must “abstain from all appearances of evil” I Thess 5:22. On the theme of the meeting: “The Lord is my Shepherd“, Archbishop Okoh referred to it as one of the most popular Psalms and in fact the entire scripture. many adopted it as prayer and learnt to recite it even as infants “Mary“, he says, “still resort to it because of its prayerful contents and encouraging messages of God’s providential care…“. He referred to the difference between the Good Shepherd and the hired hand. Jesus gave His life for the sheep but the hired hand is likened to a wolf that devours and scatters the sheep. Summarily, the message concluded that we all have equal role to play whether Clergy, Political leaders or followers. Ultimately he says, God is the Judge and will judge everyone. In attendance were the Governor and Deputy Governor of Delta State and their wives – His Excellency, Senator Dr. and Dame Ifeanyi Okowa and Otuero respectively as well as Mr. Peter Obi – the former Governor of Anambra State and the Vice – Presidential candidate of P.D.P in the forth-coming election and a host of other dignitaries were at the ceremony.